Dr. Geoffrey W. Cundiff, M.D.F.A.C.O.G., F.A.C.S., F.R.C.S.C. Dr. Geoffrey Cundiff is Professor and Head of the Department of Obstetrics and Gynaecology at the University of British Columbia and the Regional Head of Obstetrics & Gynaecology for Vancouver Coastal Health Authority. He was recently named the inaugural Dr. Victor Gomel Professor of Obstetrics & Gynaecology. A native of Texas, he received his medical degree from the University of Texas Southwestern Medical Center and completed a residency in Obstetrics and Gynaecology at Parkland Hospital in Dallas, Texas. He pursued his interest in gynaecologic surgery with a fellowships in Urogynecology and Endoscopy at Greater Baltimore Medical Center, and Reconstructive Pelvic Surgery at Duke University Medical Center. Following his training, he joined the faculty at Duke University, where he developed a training program for endoscopic surgery, doing some of the initial research in endoscopic surgical education. He subsequently joined the faculty of the Johns Hopkins Medical Institutes, where he served in several administrative roles, including, Chair of the Department of Obstetrics and Gynecology at Johns Hopkins Bayview Medical Center, and Deputy Director of the Department of Gynecology and Obstetrics for Johns Hopkins Medical Institutes. Dr Cundiff has broad-based research interests ranging from the epidemiology of pelvic floor disorders, to anatomy, to education, to the prevention of maternal obstetrical trauma. With more than 120 peer reviewed publications and 6 books, he is best known for outcomes research for pelvic floor disorders including, surgical and non-surgical treatments, and has led several multi-centered randomized trials. 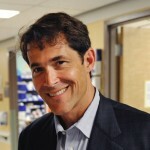 He has been a pioneer in advocating patient-based outcomes measures and has worked to develop and validate such measures. He is presently a research scientist at the Centre for Health Evaluation Outcomes Sciences and has active trials in reconstructive surgery and obstetrics. Dr Cundiff’s clinical practice, based at the Centre for Pelvic Floor Competence, is dedicated to the diagnosis and treatment of pelvic floor disorders. This offers an excellent educational environment, and he is an avid teacher, especially in the operating theatre. For his dedication to education, he has received multiple teaching awards. His present educational initiatives are the development of a competency-based curriculum for resident education and a program for practicing surgeons to expand their surgical skill.